Welcome to Aurele St. Jean Plumbing! 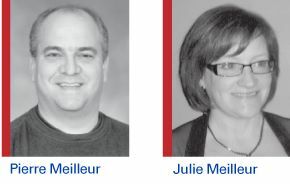 Pierre & Julie Meilleur purchased this plumbing contracting business from Aurele St-Jean in September 1990. This family owns the company to this day, having grown it from a 1-man operation to a thriving business employing 9 local people. With Aurele St. Jean Plumbing, you never have to worry - we're fully insured. We employ 5 licenced plumbers (2 of them being Master Plumbers) and 4 registered apprentices. With our expertly trained staff, we can meet all of your plumbing needs, from drain cleaning to commercial plumbing. We're also a certified Wirsbo in-floor heating installer. Our plumbers specialize in excellent customer service, treating your home as we would our own. This service continues until well after the sale as we work to make sure you’re completely satisfied. You can always count on quality products and quality workmanship from Aurele St. Jean Plumbing, where no job is too big or too small. Call us today.